In the main menu, you have different options for your torrent. Open your favorite web browser. We recommend using Google Chrome or Firefox. Submit the WebUI address as provided in the Seedbox login credentials email in your browser (e.g 124.567.890:8090/gui). Next thing to do is to download .torrent file from some Torrent sites (there are plenty of them on the Web) or copy Magnet URL. In uTorrent, you can download torrents using 3 methods. In this tutorial, we will explain the exact use of all of them. The Same principle is used when loading torrents via magnet link. The same principle as with loading torrents via file and magnet link can be applied to the RSS feed. 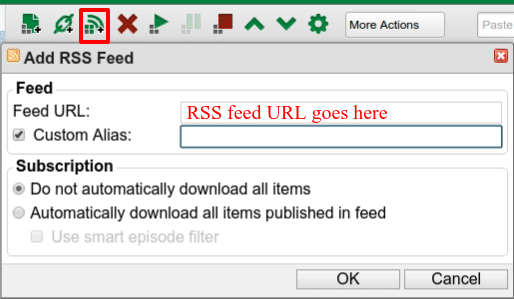 After we paste RSS feed URL, we can choose if we want to download all items in the feed automatically, or we only need a list of torrents fetched via that RSS feed and we can individually select torrents that we want to download. If the torrent is loaded successfully we can monitor all stats regarding that loaded torrent. Files tab is uTorrent is dedicated for showing us specific information about all files that are downloading in one torrent. We can find info such a: Name of file, extension of a file, it’s total size, downloaded data in percents and priority of file. In the General tab, we can find various info of selected torrent. In peers tab, we can find information about peers connected to our torrent. We can find information like their IP, client they are using, the percentage of downloaded data, relevance, their download speed and upload speed. Speed tab is displaying real-time graph of our both upload and download speed.